PESHAWAR: Commandant FC Sifwat Ghayur along with at least four guards has been killed in a powerful suicide blast in Peshawar area of Saddar, Geo News quoted SP Cantt Wednesday. The SP Cantonment said the suicide bomber targeted the FC vehicle, adding the injured have been shifted to LRH. The blast occurred at Deens Chowk, a usually crowded commercial spot. 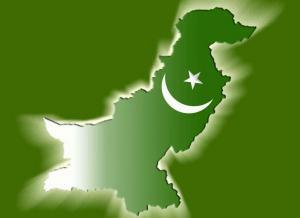 The blast damaged at least three vehicles including one FC’s vehicle carrying Sifwat Ghayur, FC’s Commandant. The FC Headquarters is situated near the blast site. The Bomb Disposal Squad, police and other law enforcement agencies approached the area before long and put a security cordon around the blast site. The firefighters are busy with efforts putting out the fire that encompassed the vehicles after the blast. Karachi violence claims six more lives, (54 killed so far). Death toll reached 82 on date. 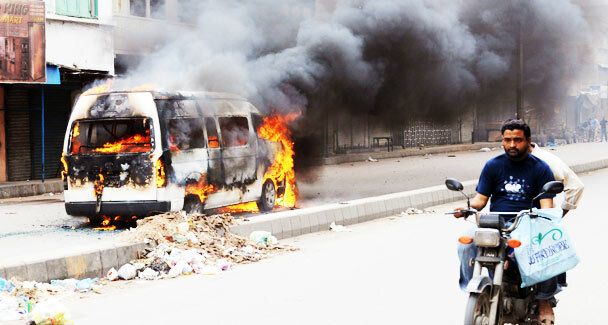 A motorcyclist rides past a burning van following overnight violence in Karachi on August 3, 2010. – Photo by AFP. KARACHI: The death toll from violence triggered by Monday’s murder of Syed Raza Haider, a senior leader of the Muttahida Qaumi Movement and member of the Sindh Assembly, rose to 54 after six more people were killed on Tuesday. More than 130 were injured, officials said. After a brief lull in violence arson attacks and intense firing resumed and within an hour four people were killed in Orangi Town and two in Charpai Gali. Armed men on a motorcycle pulled outside a general store in Orangi’s Faqeer Colony and fired at Ameer Ali and Wasim. They were taken to the Abbassi Shaheed Hospital, where they died. Officials at the hospital said they had received another bullet-riddle body from the same area. He was identified as Sharafat Khan. Unknown gunmen fired multiple shots on a group of people in Charpai Gali, killing two youngsters on the spot. They were identified as Fayyaz and Mahmood. Their bodies were moved to Abbassi Shaheed Hospital. In Aram Bagh area, a man in his mid-20s was gunned down. He was identified as Aslam Khan. A number of vehicles, shops and pushcarts were set on fire in different localities late in the night. Six trucks were set ablaze near Easa Nagri, a taxi on M.A. Jinnah Road and a teashop in PIB Colony. Business activities in most towns and cities of interior of Sindh remained suspended and transport was off the roads on Tuesday. Hyderabad, Latifabad, Mirpurkhas, Nawabshah, Sanghar, Umerkot, Kotri, Dadu and Sukkur remained shut while business activities in Thatta and Tandojam were normal. Some areas resounded with firing. Some shops and vehicles were torched and scattered incidents of violence were reported. Armed youths patrolled markets to ensure that these were closed. Death toll reached 82 on date in recent Karachi violence. Last updated on 7th Aug, 2010. Inshallah !! The site is again updated.